Papua New Guinea's commitment towards supporting its neighboring Pacific Island country Tonga to host the 2019 Pacific Games is now before the National Executive Council (NEC). This was confirmed by Minister for Sports and APEC Justin Tkatchenko when asked by Post-Courier to provide updates on what the PNG Government has accomplished so far in terms of funding allocation and assessment of venue upgrades in Tonga. "We have submitted to NEC an information paper outlining assessments highlighted by engineers, architects and project management surveyors on cost estimates for the main stadium and also the High Performance centre," said Tkatchenko. 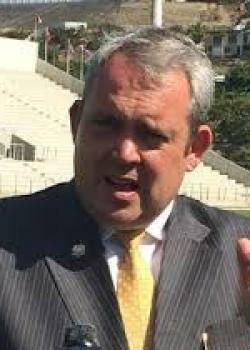 Tkatchenko said K45 million (US$14.1 million) is the estimated cost funding to upgrade the Teufaiva stadium including the High Performance Centre and other technical human resource assistance for the benefit of hosting the games. Tkatchenko also highlighted that Prime Minister Peter O’Neil has written to the Prime Minister of Tonga Samuela ‘Akilisi Pohiva advising him on the full assessment of the funding that is required for the 2019 Pacific Games. "Because of cash flow situations faced within PNG economy at the moment, we are looking at options on how much funding will be allocated to upgrade the facilities and other assistance in respect to human resource systems in different areas of running the pacific games," said Tkatchenko. "The final decision is based with the Prime Minister on how much will be given but it is already gone through NEC." Meanwhile Pacific Games Council executive director Andrew Minogue said from the council’s perspective, they want to see more action on the venues construction this year. "The Games Organising Committee is, however, on time with its planning and doing a good job," said Minogue. The two main venues will be the Teufaiva stadium for ceremonies, athletics and rugby while the Tonga High School precinct will host swimming and indoor sports. Minogue also confirmed that there will be other venues scattered around the town including at Atele-Indoor arena, football complex and golf course plus the waterfront for beach volleyball and archery.